« Browns with Interest in Cardinals QB Kolb? 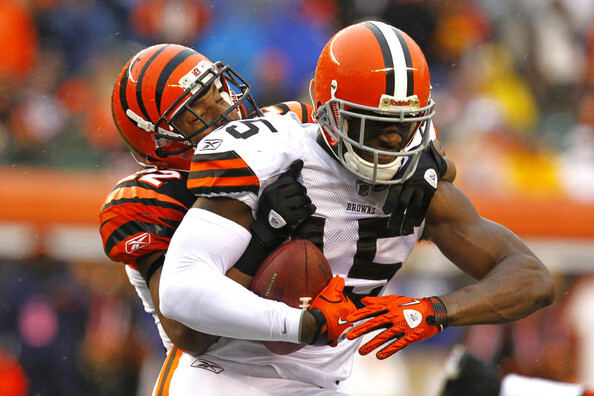 The Browns failed to score much in 2011, putting up their lowest point total since 2000. Today, with free agency and the draft still to come this offseason, we take a look at some of the spots the Browns should focus in on to improve on. 1. Wide Receiver – Many people are on the bandwagon of the team picking WR Justin Blackmon with the 4th overall pick in the draft – and why not? He’s the playmaker the team sorely needs, as right now the club is sorely lacking in that area. Josh Cribbs and Greg Little are nice wide outs, but let’s be real, they are never going to scare a team. Right now no one on this team can go downfield and catch passes. 2. Quarterback – Yes, the position that the Browns never seem to get right. Colt McCoy is a nice person, and a nice player, but he’s never going to get this team to a Super Bowl. Could Robert Griffin III get them there? Right now I think people would love to find out. He’s the game-changer that the Browns could need, but it’s not really in the makeup for the Browns to take him – but they really should think about it if he’s there. 3. Linebacker – This is the team that passed on LB’s in the past few years like Clay Matthews Jr. and Rey Maualuga, and now it’s an area they really could use an upgrade. D’Qwell Jackson is the best player on the team in that position, but he can’t play all the spots for the LB’s, and he himself is getting older and has been hurt. The team needs to use at least 1-2 spots in the draft or free agency on this position. 4. Cornerback – Joe Haden has been a nice pickup for the team, but they need another player on the corner, as Sheldon Brown is not the long term answer. Plus Haden didn’t play nearly as well after he suffered a knee injury. They could use a high draft pick on a CB, and he could sit behind Brown for a season before joining Haden as a starter in 2013 or maybe in the second half of 2012. Here we go yet again. Rumors are the Browns trading up for Griffin? Why?! We have shown that we will not get help through FA, only the draft. With all the holes we need to fill your going to spend draft picks on another Colt McCoy? Griffin is nothing more than Colt with a stronger arm, another unproven rookie with now weapons throw to and no front line to protect him. For what we would have to give up to get him would set this team even farther back than we are now. Try shoring up the line and give Colt someone to throw to who teams actually have to game plan for. Griffin is nothing more than Colt with a stronger arm, another unproven rookie with no weapons throw to and no front line to protect him. For what we would have to give up to get him would set this team even farther back than we are now. Without question, the QB is the key piece to making a team play-off caliber consistently. Yes, there are the Dilfer Ravens and the O’Donnell Steelers — but those are exceptions with teams that had suffocating defenses — and I don’t see anything like that around here. “Surrounding pieces” is a short dance if there is no one to surround. My concern with Kolb is the amount of $$ it will take to get him combined with possibly bailing on McCoy too early. Then, of course, there are the Mike Phipps, Tim Couch and Brady Quinn realities. I am not convinced that McCoy can get the ball downfield consistently. For that matter, I am not convinced that our WRs can get downfield consistently, either. I watch a guy like Tebow and am amazed he even gets on the field at all; his mechanics are atrocious. I suspect this was his year — but what do I know? I thought rap would only last 5 years, too. Like it or not, patience in Cleveland is no longer a virtue. We have had over a decade of bumbling, mistakes and lack of damn near everything. A generation of Browns fans have witnessed nothing but this and old films of Bernie Kozar and Jim Brown. This is hardly satisfying fare for anyone. QB may be the key piece, but it’s not likely going to be from a 1s round draft pick. For every one of the Aaron Rodgers and Worthlessbergers drafted, there are 10 Notre Dame failures from the 1st round. We call that terrible odds. There’s more of a chance that we can maintain a good QB if he isn’t on his back all the time. Pick 2 (first round) and 3 (second round) need to be used to replace the right side of our O-line. I won’t argue about taking a play-maker that falls to us in one of those spots, but we can’t let the O-line replacements fall past the early 2nd round. Solidifying the line gives McCoy and Hillis a chance to show their max potential. If Blackmon falls to the Browns at 4 take him! Moving up mortgages the future. With a #1 WR, and a completed O-line, they could probably bounce Little between WR and HB to give the offense some flexibility. It doesn’t address the LB need, so that will have to be filled through FA. As for a QB, I am right with Holmgren that you should draft a QB every year. As long as they take flyers on 5th-7th round QBs, and don’t take chances with picks that have a decent chance at producing. Sound logic. And this is what makes me believe that Kolb has a strong chance of landing in Cleveburg. IMO, a team should take an OL in the first two rounds every draft — unless there is a compelling reason not to, i.e. established OL without an apparent weakness under years of contract. Is Griffin a franchise QB? Shouldn’t BQ still be lining up under center for the Browns(the “NFL-ready” QB)? And Phipps (Warfield for this?)? And Couch (don’t even know what that was)? Cleveland is going to need an RB if everything I read about Hillis being gone is true. I am not crazy about burning top-10 draft picks on short shelf-life RBs. Can get a decent RB in Rounds 2 or 3, to be sure. But, they need WRs, too. With a good OL, an average RB can do many good things. Only need 4 yards a carry for 25 carries a game — a little less than half the offensive plays in a typical game — to be looking at 1600 yards in a season season. And, like it or not, we need CBs and at least a couple of OLBs, as well as a DE that can rush. Not gonna get all that in this draft — maybe 3 of those pieces, at best. FA will determine what direction Cleveland goes in this draft.